Days are free for trips in Singapore and the nights are for the sights and sounds of Formula 1®. In addition to the thrilling on-track action, look forward specially curated off-track entertainment line-up comprising world-class international music acts, theatrical performances, and illusionists and roving artistes throughout the 799,00sqm Circuit Park. The main performance stages are in Zone 1 and Zone 4. Refuel at various food and beverage outlets are available throughout the Circuit Park. For local and international delights it is the Dockside Hawkers in Zone 4. 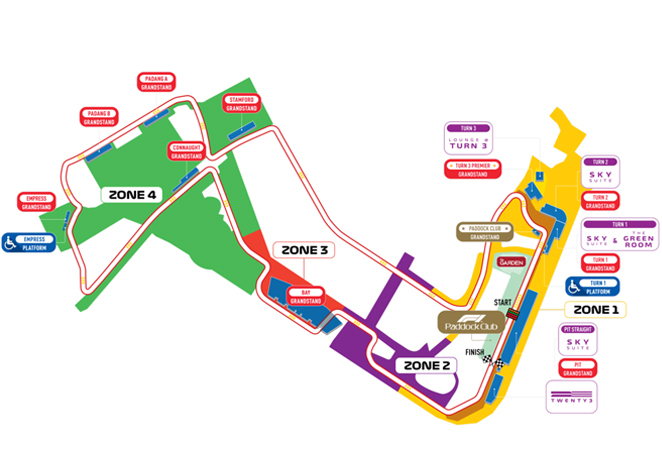 Zone 3 offers a wide selection of food and beverage outlets, where patrons can enjoy savoury snacks, an ice-cold beer or a cup of coffee whilst the cars race past just metres away. Complete your night race experience by picking up official FORMULA 1 SINGAPORE AIRLINES SINGAPORE GRAND PRIX memorabilia or official Formula OneTM Team Merchandise at merchandise stores located throughout the Circuit Park. 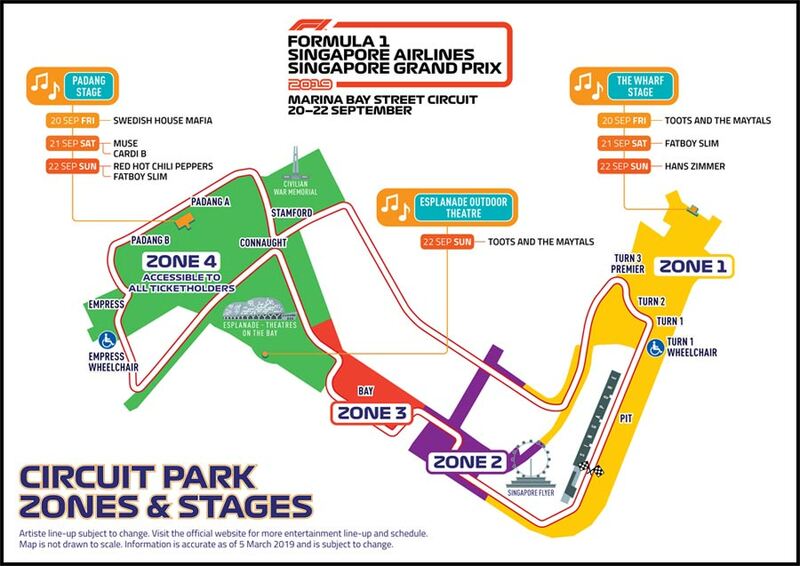 The specially customised Combination Packages offer patrons the flexibility to experience different parts of the street circuit on each of the three days. Premier Walkabouts (3 days) - are viewing platforms strategically located throughout the Circuit Park. Patrons in wheelchairs and their companions can enjoy up-close views of the cars as they head towards the historical Anderson Bridge. From the wheelchair accessible platform, patrons can also access the Circuit Park’s key attractions within Zone 4 which includes the ample entertainment, food and beverage offerings via the underpass at the foot of the Anderson Bridge. Patrons have access to Zone 4. Strategically placed at the first turn, patrons in wheelchairs and their companions will have brilliant vantage views of cars tackling the first turn. Patrons will also be in close proximity to the concerts at The Wharf Stage with access to the entertainment, and numerous food and beverage offerings located at the F1® Village. Patrons have access to Zones 1, 2, 3 and 4. Please contact us for your Singapore Grand Prix packages 2019.